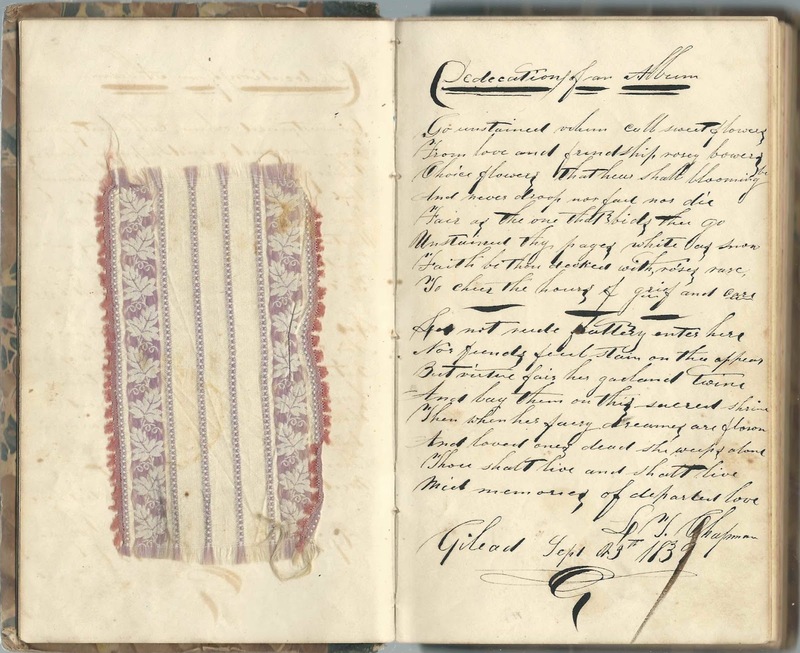 1830s/1840s autograph album kept by Polly Patch Wight of Gilead, Maine, before and after her marriage to Daniel Freeman Bean. The circle illustration appears to have been added by Polly. 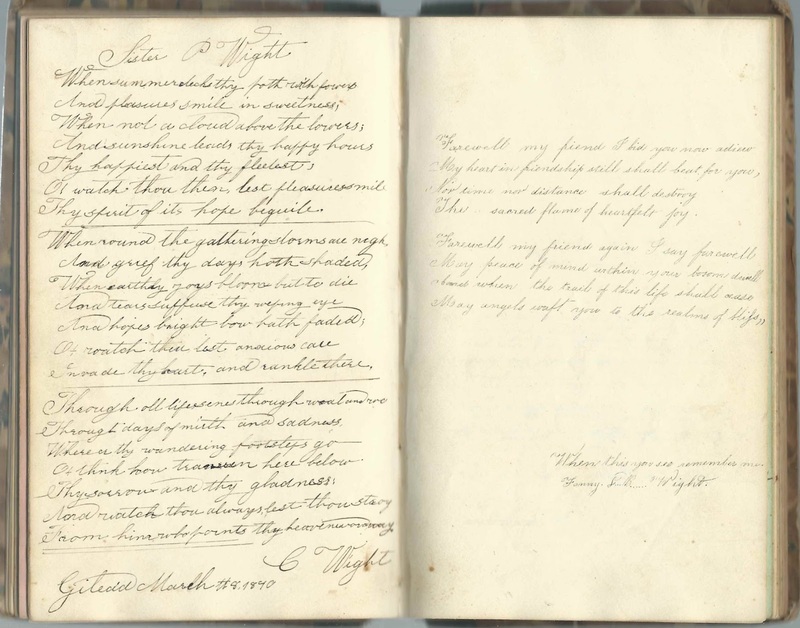 Someone, presumably, Polly, penned a page describing the purpose of an autograph album. 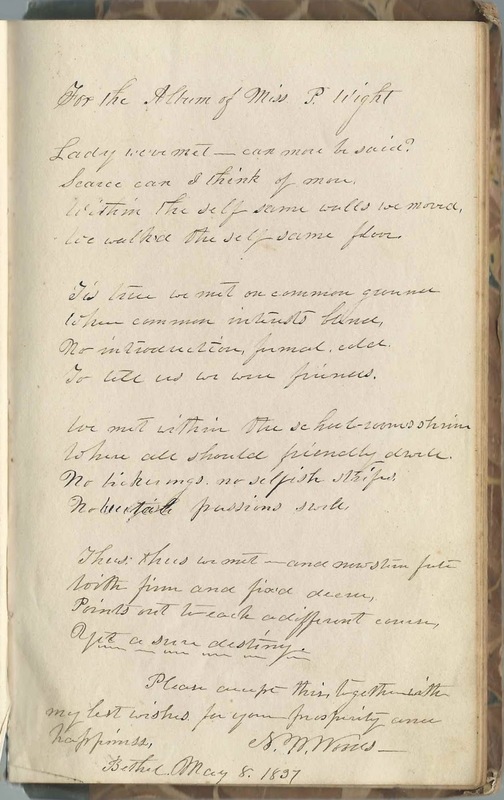 The person who dedicated the album may have been L. T. Chapman, inscribed at Gilead, Maine, in September 1839. Tucked in the facing pages is a beautiful piece of fabric, whose original purpose I'd dearly love to know. The album measures approximately 8" x 5" and is fairly thick. It contains the sentiments of 34 of Polly's relatives and friends. An alphabetical surname list and an alphabetical list of the signers, together with any personal information they offered, appear at the end of this post. Polly Patch Wight was born May 3, 1811 at Gilead, Maine, the daughter of Ephraim and Susannah (Patch) Wight. 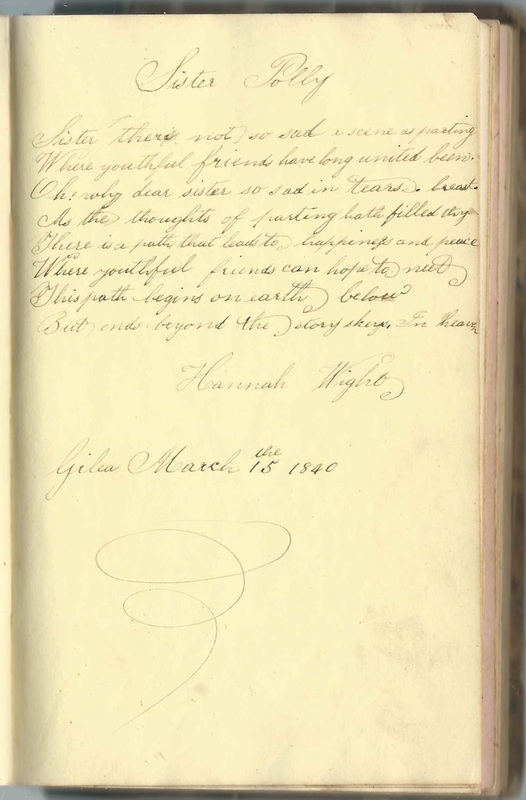 Polly's sister Hannah Wight inscribed a page at Gilead, Maine, on March 15, 1840. 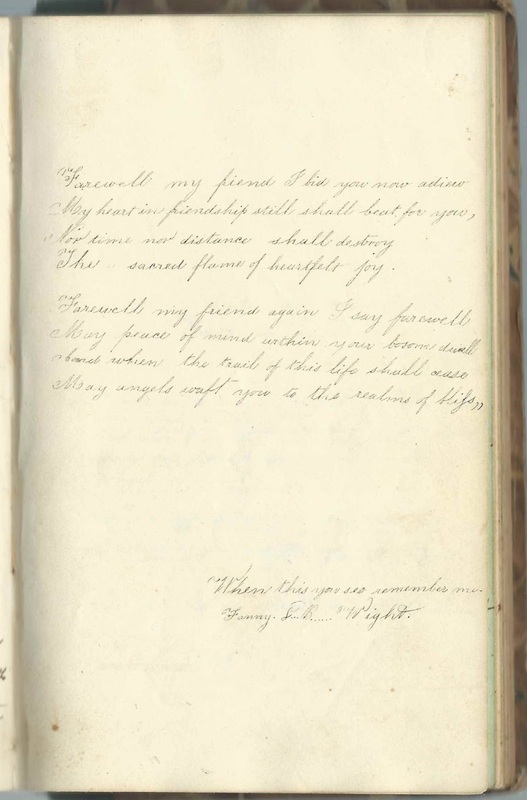 Polly's brother Caleb Wight of Gilead, Maine, inscribed a page on March 8, 1840; his wife Frances Lary (Burbank) Wight, "Fanny", signed the right facing page. 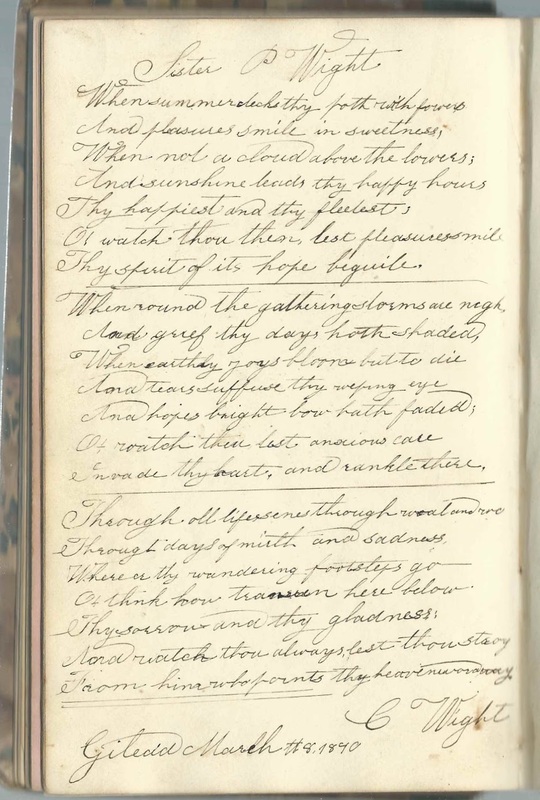 Please refer to the list of signers below for the names of additional relatives who inscribed pages in the album, including some who didn't express a relationship on the pages. Those who did express a relationship were members of the Adams and Wight families. On April 7, 1840 at Gilead, Maine, Polly Patch Wight married Daniel Freeman Bean, son of Ebenezer Shaw Bean and Eunice C. (Kendall) Bean. Polly and Daniel, or perhaps "Freeman", farmed at nearby Bethel, Maine, and raised, I believe, six children. Sadly, it appears that the children, with the possible exception of Daniel Freeman Wight, Jr., died in middle age, the first two before the death of their parents. Polly Patch (Wight) Bean died in 1888, and her husband Daniel Freeman Bean died in 1893. Below are a few pages with names that I can't decipher, but they might jump out easily to readers with knowledge of Oxford County, Maine, genealogy. The page below was signed at Bethel, Maine, on June 1, 1837. 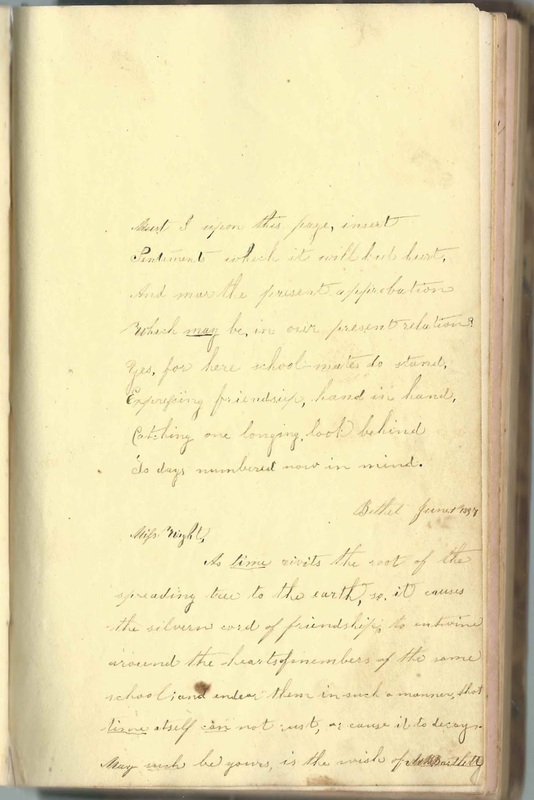 The page below was signed at Bethel, Maine, on May 8, 1837. S. A. C., signed at Bethel, Maine, in 1845; inscribed to "Mrs. Polly P. Bean". Initials E. F. T. R., signed at Gilead, Maine, on June 13, 1838. Not positive of first two initials. Unnamed, signed at Gilead, Maine, on September 25, 1839; inscribed to "Miss P. Wight"
Hard to read initials and surname. First initial could be S or N. Middle initial could be N or M or W; Surname could be Woods or Moores. 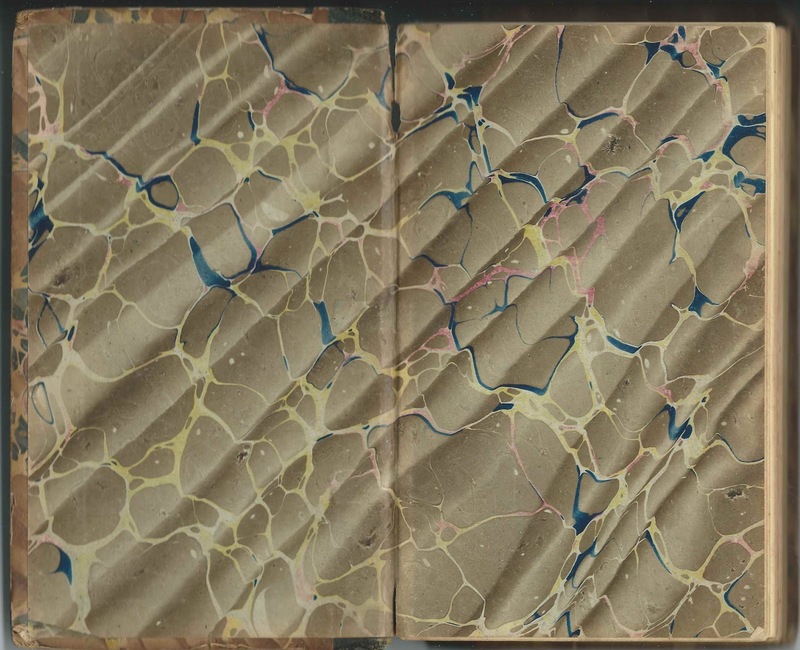 Signed at Bethel, Maine, on May 8, 1837; inscribed "For the Album of Miss P. Wight". Israel Adams, signed at Gilead, Maine, in April 1838; inscribed to "Miss Wight"
Olive Adams, signed at Gilead, Maine, on April 1, 1838; inscribed to "Cousin Polly". Olive was the daughter of Isaac and Olive (Wight) Adams, a sister of Polly's father Ephraim Wight. Lucy Adams, signed at Gilead, Maine, in April 1838. Mary M. Greenwood. Presumably Mary Maranda Greenwood, daughter of Ebenezer and Salome Greenwood. Susannah Grover, signed at Solon, Maine, in 1838; inscribed to "Miss Polly Wight"
W. Newell, signed at Bethel, Maine, on May 18, 1837; inscribed to "Miss Polly Wight"
Thomas N. Paine, signed at Bethel, Maine, in March 1838; inscribed to Miss Polly P. Wight". Presumably Thomas Neal Paine, son of Thomas Neal Paine and Mary (Grover) Paine. 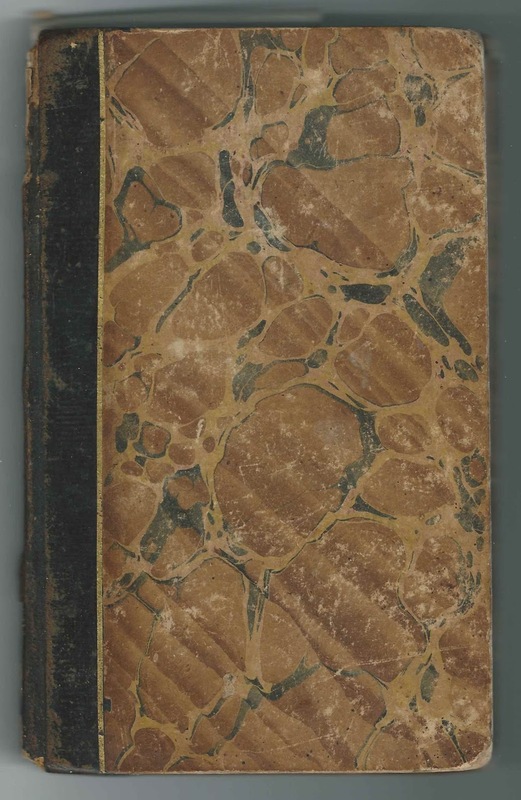 M. A. Paine, signed at Bethel, Maine, in 1838; inscribed to "Miss Wight". Presumably Mary Ann Paine, whose brother Thomas Neal Paine signed the preceding page. Isaac Randall, signed at Bethel, Maine, on May 9, 1837; inscribed to "Miss Wight". L. B. Smith, signed at Bridgton, Maine in February 1838; inscribed to "Miss Wight". Thomas E. Twitchell, signed at Bethel, Maine, in March 1838; inscribed to "Miss Wight". 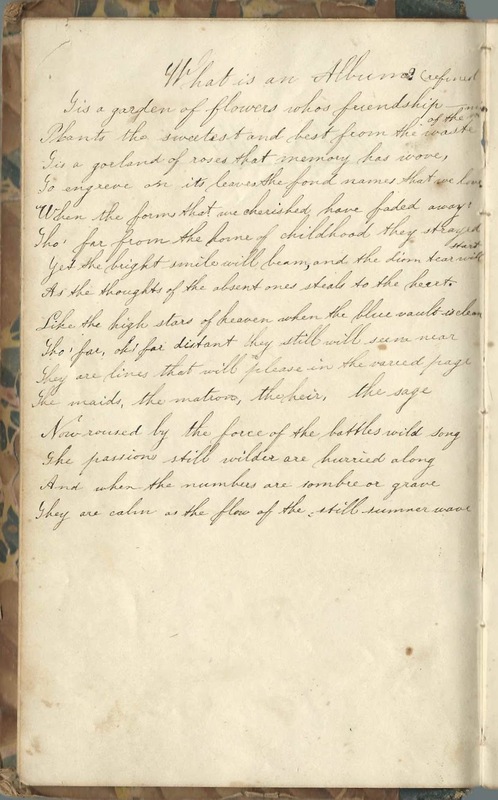 Hannah Wight, signed at Gilead, Maine, on March 15, 1840; inscribed to "Sister Polly". Hannah Wight, Polly's sister, would marry Eliphalet Burbank the next month, on April 7, 1840. William Q. Wight, signed at Gilead, Maine, on September 15, 1847. William Quincy Wight, son of Polly's brother William Wight and wife Phoebe (Mason) Wight. C. Wight, signed at Gilead, Maine, on March 8, 1840; inscribed to "Sister P. Wight". 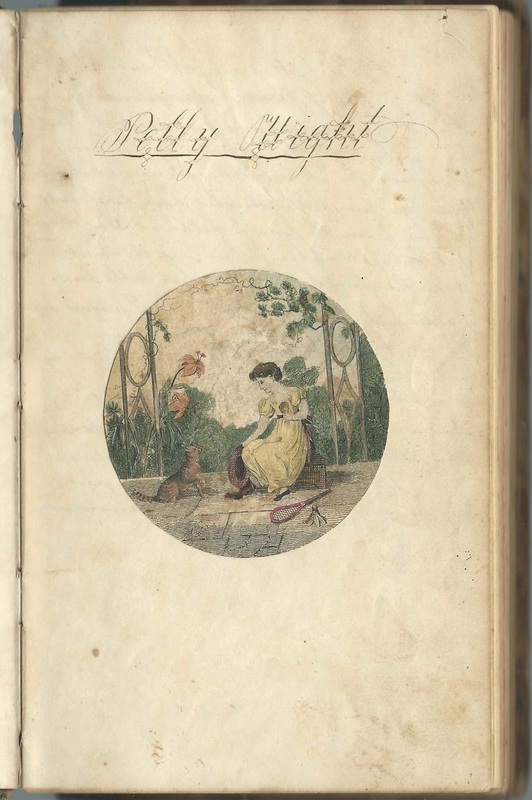 Polly's brother Caleb Wight, whose wife Fanny (Burbank) Wight signed the right facing page. Fanny L. B. Wight; presumably Frances Lary (Burbank) Wight, whose husband Caleb signed the left facing page. Maria M. Wight, signed at Gilead, Maine, in 1847, inscribed to "Aunt P". Maria Matilda Wight, daughter of Polly's brother William Wight and wife Phoebe (Mason) Wight . Esther S. Wight, "your cousin"; inscribed to "Mrs. Bean". Presumably Esther Sewell Wight, daughter of Seth and Lydia (Mason) Wight. Rhoda E. Wight, signed at Gilead, Maine, on February 21, 1847; inscribed to "Aunt Polly". Rhoda was Rhoda Emaline Wight, daughter of Polly's brother Gardner Wight and his wife Rachel (Stiles) Wight. Laurentia Wight, signed at Gilead, Maine, on November 27, 1847; inscribed to "Aunt Polly". She was the daughter of Polly's brother Timothy Wight and his wife Maryanne (Green) Wight. Incidentally, her name appears in online trees and in some records as Lorentia, but she spelled it Laurentia. Cordelia Wight, signed at Gilead, Maine, in 1847; inscribed to "Aunt Polly". Cordelia Eliza Wight was the daughter of Polly's brother William Wight and his wife Phoebe (Mason) Wight. Sarah P. Wight, signed at Bethel Hill, Maine, on March 13, 1838; inscribed to "Cousin Polly". Daughter of Eli and Fanny (Chaplin) Wight. Eli was a brother of Polly's father, Ephraim Wight. This my mother's father's Wight Ancestors, She would love to see this. She is 72 this month. I have pictures of gravestones from the Chapman Cemetery in Gilead, of most of these people. I am very interested in this. So happy that you landed on this blog! You can contact me by email - which is under Inquiries near top right.